Sailing north from Ketchikan on the Alaskan Marine Highway ferry for 10 hours, I arrived at the Southeast Alaskan town of Petersburg. Unlike Ketchikan or Juneau, the large cruise ships do not stop at Petersburg. Because of this there are no fancy gift shops or restaurants for tourists. This quiet town's main industry is commercial fishing. Various fishing boats call this place home. 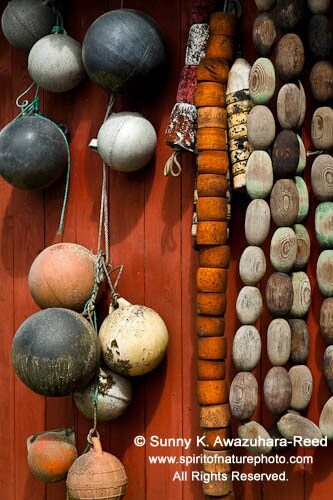 They often will tie up at the cannery buildings that are lined up on the waterfront to receive the fish. 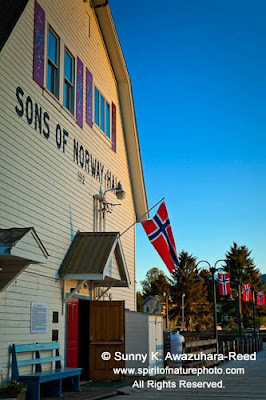 This quiet town was originally settled by Norwegian fishermen. The Nordic style buildings still remain throughout the town today as the descendants of the Norse people fish in the nearby icy waters. Petersburg was a very different experience for me than Ketchikan. 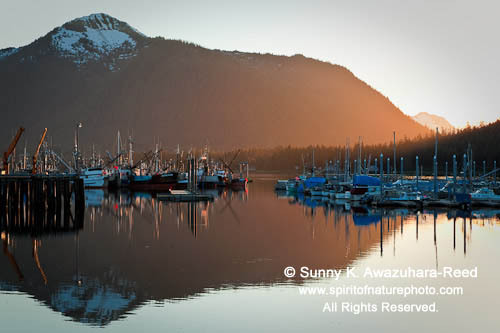 When I arrived to Petersburg, the sun was setting behind an island...unlike typical Southeast Alaskan weather, the sky was clear in the evening. The distinctive peak of Devils Thumb on the United States and Canadian border was showing itself. The mountain peaks were glowing in shades of purple! 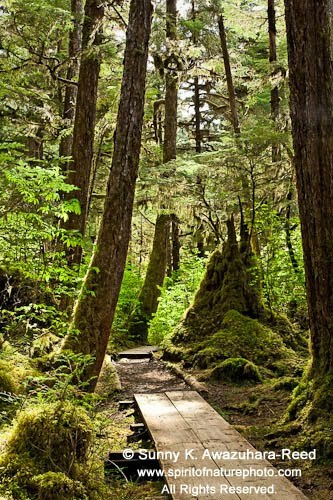 Petersburg is also surrounded by the Tongass National Forest. 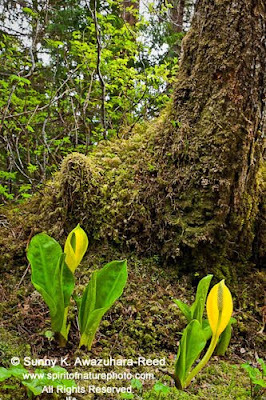 This temperate rainforest is highlighted by many bogs. 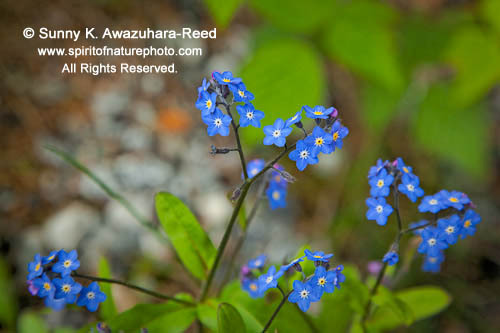 I spotted the small blue flower: "Forget-Me-Not" along the road. 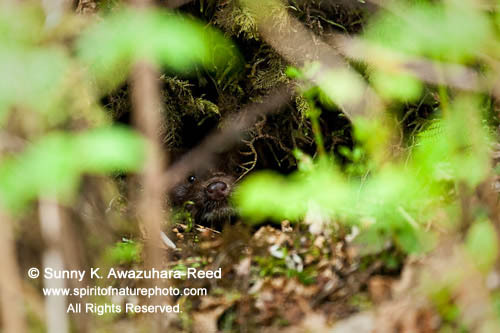 When I was photographing the flowers, a river otter popped out from a stream! He was obviously surprised and ran away...hiding in a hole under a tree root. Surprised myself, and curious, I waited for him to come out of his home in the tree. After watching me from the hiding spot for a while, the otter quickly jumped out and ran away. Another beautiful day, I was on a small boat and crossed Frederick Sound. The boat took me into a quite narrow cove. The low tide exposed the beautiful tidal lines on the shore. 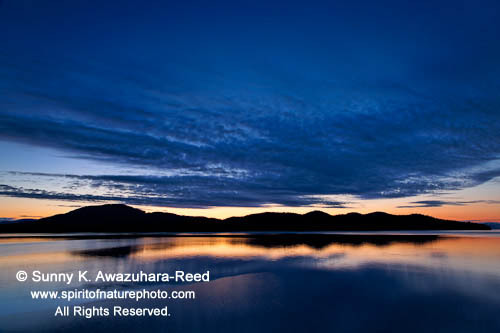 I loved the patterns of the natural world on the shore and the reflections on the water. 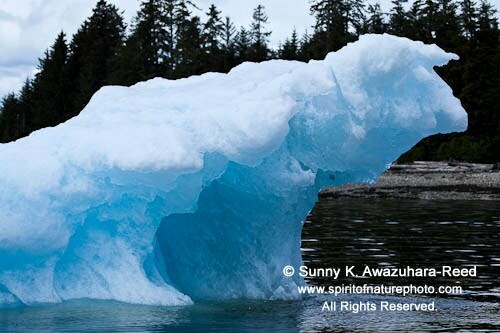 Icebergs drifting from LeConte Glacier. They reflected the aquamarine blue on the ice. After returning to the port dock, I was busy capturing the beautiful painted Nordic style buildings while the sun bathed the environment. The sunset wasn't as crimson as the first day but it was still a beautiful evening. 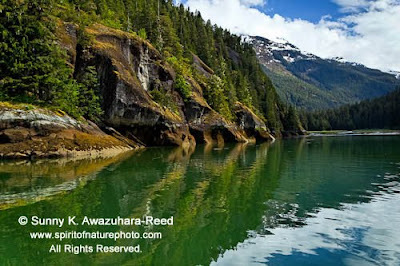 My next destination is Skagway, the gold rush town with an interesting history. My first stop in Southeast Alaska was Ketchikan. 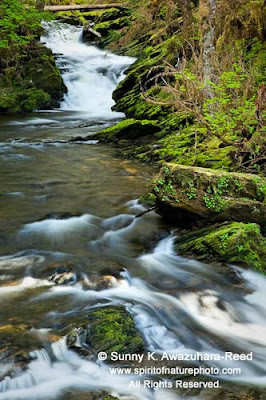 This beautiful place is known for native Alaskan totem poles, and its rainy weather. 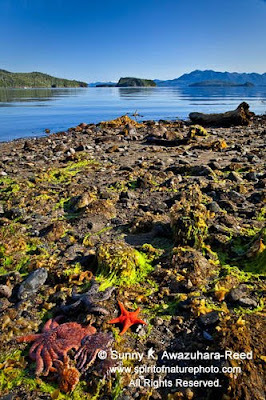 Ketchikan is also the wettest town in the United States and one of the cruise ship ports of call. While I saw these monstrous ships tied to the dock, the town was a full of tourists with shopping bags. Escaping the crowds, I hiked up Deer Mountain. The trail began in deep old growth forest. It was spring in Southeast Alaska, different hues and shades of green were vivid in my eyes. The thick moss that carpeted the ground was also fresh green! It was the time for Skunk Cabbage blooming. The trumpet like bright yellow flowers were everywhere on the woods floor. These sure had a unique smell. 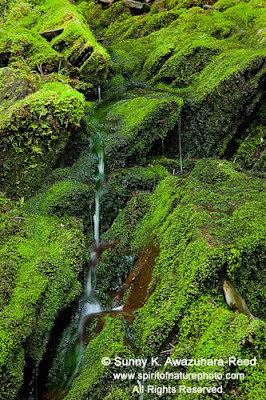 I loved the mossy rock with streams! 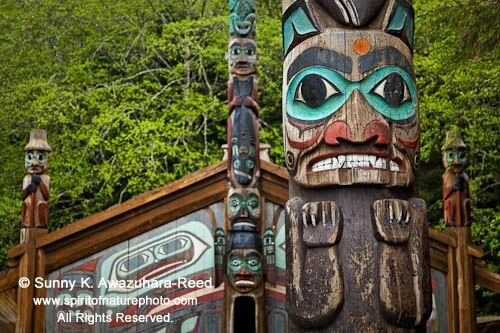 For the next few days, I explored Alaskan Native culture in Ketchikan. I spent a few hours alone at Totem Bight State Historic Park in the rain. Walking among the totem poles and the Cran House surrounded by the dark rain forest, I felt like I was connected with their native spirits. When I was ready to leave the park, a big coach full of colorful clothed tourists from the cruise ships came in. I was so glad to experience the quiet moment in the park. 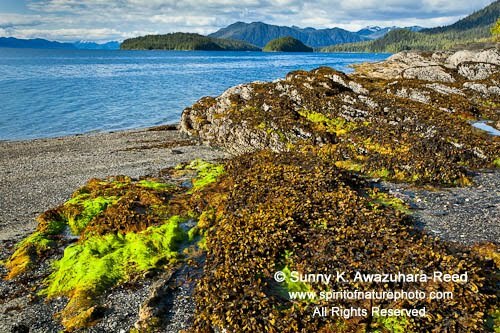 I had another beautiful hike at Settlers Cove, at the north end of the Tongass Highway. This mossy rain forest is indicative of larges parts of Southeast Alaska...I just love it! Beautiful waterfalls in the woods. The wild coastline full of seaweeds! It was a low tide in a morning. Numerous sea creatures were exposed on the shore! 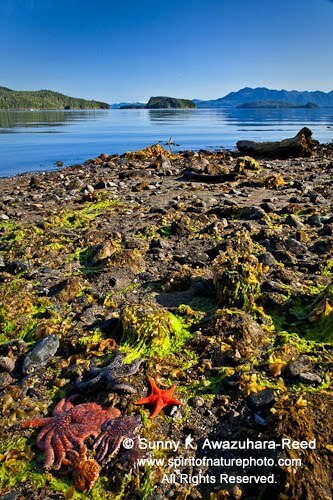 Hundreds of Sea Stars...so many Sunflower Sea Stars came out! 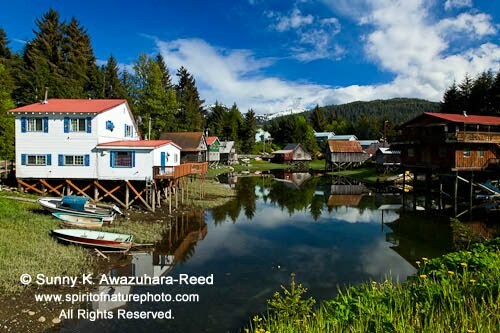 Ketchikan was an attractive little town with interesting culture and beautiful natural surroundings. 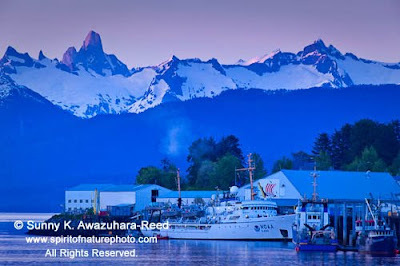 My next stop is Petersburg, about 100 miles north of Ketchikan on a ferry.